An average scalp have 100,000 to 150,000 hairs. It’s normal to shed 50 to 100 hairs per day. Hair normal growing speed is 1/2 cm to 1 cm per month. If a person has a good head of hair at the age of 40, without receding hair lines, he will have a good head of hair all his life. However, if a person is to become shiny bald, except for the fringe area, the process usually starts at the age of 13-20. In rare cases, excess loss of scalp hair can start at the age of 15. Baldness is a state known as complete hair loss from scalp it is divided in two pattern to understand it very well that is known as male pattern baldness and female pattern baldness ,there are only the difference of causes for such condition. Otherwise baldness is the condition which follows the sudden hair loss started due to some changes in dietary habit environmental factor and chronic illness. Every therapy has the different opinion to explain this point. In ayurveda Baldness is termed as “Khalitya” Ayurvedic herbal treatment is aimed at treating known causes, immunorestoration, treating the local scalp condition and reducing stress. 1. Male Pattern Baldness: Male baldness usually begins with thinning at the hairline, followed by the appearance of a thinned or bald spot on the crown of the head. Receding Hair Line (Thinning Hair). Centralized loss on the top back of the head (vertex). Diffuse thinning where hair thins all over without losing the shape of the hair line. 2. Female Pattern Baldness: Women with common baldness rarely develop bald patches. instead, they experience a diffuse thinning of their hair. There is a visual representation of female hair loss that will allow you to assess your own situation. It is called the Ludwig Scale of Hair Loss. In Ayurveda, hair is considered to be a byproduct of bone FORMATION. The tissue responsible for building bones are also responsible for the growth of hair. According to Ayurveda early hair loss is related to body type and the balance of the mind-body constitution (doshas imbalance). As well as poor circulation to the scalp is amongst the main factors contributing to hair loss. Oiliness & tightness of the scalp, can be exacerbated by stress and poor diet. This condition can inhibit blood flow, particularly to the top of the head, preventing nutrients and essential elements from reaching hair follicles. The capillaries which feed the ‘mother of hair’ bulbs are so extremely small, it is very easy for the blood supply to be pinched off, just as the tube supplying blood to the body by transfusion can be pinched shut. Hair bulbs cannot receive blood when the tubes of capillaries are shut off. Hair follicles are one of the most rapidly metabolizing tissues in the body. Their high metabolic rate requires an excellent blood supply to carry oxygen and other nutrients to the cells. If the blood supply diminishes, the follicles grow into gradual decline, vanish and merge with skin tissue. Therefore, circulation and stimulation of the scalp must be maintained in order to maintain a full head of hair. The following symptoms may become noticeable at any given age, though generally becomes more prominent with age. Excessive Hair Fall: It starts with unusual large amounts of hair in brushes, on clothing, and in the drains of sinks and tubs. It tends to be progressive. Hair thinning: density begins to decrease. Hair is generally not as thick as it may have been months or years prior to its current state. Women typically have gradual hair thinning throughout the scalp. Women’s hair loss is experienced as a diffuse thinning of their hair. Receding hairline: an area of balding over the frontal part of the head that gradually increases over time. Breaking of hair shafts: Hair starts breaking from the middle not from the root. Itchy scalp, scaling: itching, flaking, or redness of scalp. Red, scaly, abnormal skin around the hair loss area. Bald patches: a circular area of baldness covering the crown, or top-rear, of the head. Only hair around the ears, the sides, and back of the head remains, as horseshoe-shaped pattern that leaves the crown of the head exposed. Women with pattern baldness rarely develop complete frontal bald area as men do. May be losing hair from other parts of your body other than the scalp. Ayurvedic Experts formulated and tested to treat all types of Baldness & Alopecia. Hair Cream – New Growth (55 gms). Ayurvedic Experts formulated and tested to treat all types of Baldness. 100% natural active nutrients, safe with NO-SIDE EFFECTS. Treat the ROOT cause of Baldness. Treatment is also effective for even genetic case of hair loss. Our treatment stimulates the circulation in the scalp, allowing oxygen and necessary nutrients to be transported to the hair follicle. 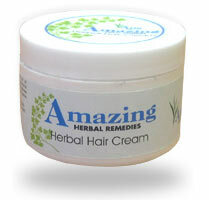 Herbal Hair Cream grows new hair on the bald scalp. Provides Hair Follicle rich diet and the nourishment. It normalizes blood circulation of the scalp & open the blocked capillaries which feed the roots. Promotes the growth of a new Hair, thus converting the thin hairy area into full head of Hair. Controls Hair-loss (Falling of Hair). Helps in maintaining the proper texture and the size of Hair. Also removes both dry and wet Dandruff. Apply 1/4 to 1/2 tea spoon of the cream or the sufficient quantity diluted with 1 tea spoon water, to cover the complete scalp area. Gentle massage into the scalp for few minutes. Leave it on scalp for a min. of 1 hour. Use once daily or alternate days (over night or in the morning), till the desired results are attained. These observed contents of the oil controls the sebum flow from the sebaceous glands, thus helps to prevents the problem of dandruff and early death of hair, resulting in the control of Hair-Loss. It also promotes the Hair growth and checks Hair-Fall, Dandruff and Thinning of Hair. Stops itching & scaling instantly. Regular use of this Herbal Hair Oil grows New-Hair on the Bald Scalp and cures the problem of Dandruff permanently. The observed content of the oil also acts on Melanin secreting cells, that help in maintaining the natural color of the Hair. Message the Herbal Hair Oil gently with the finger tips in the roots of the hair. Each application should cover the scalp completely. Apply it once a day at night and wash it in the morning. 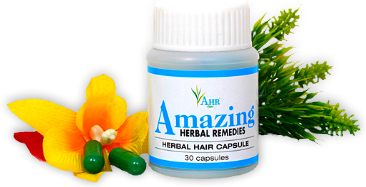 Herbal Hair Supplement & its natural herbs helps to balance all three body hunour or doshas (vatta, pitta, kapha). Contains specific nutrients that are not easily obtained from dietary sources alone that influence on hair growth and hair health, as deficiencies of specific nutrients can actually promote a loss of hair. It also helps to normalize the metabolism of the skin & scalp, activates blood circulation which helps restore new growth. It provides strength to the weak hair and convert thin hair into thick. Since chemically based hair shampoos are applied directly to your scalp hair root, and this is where the blood supply is the richest, you can imagine how easy it would be for these chemicals to get into your bloodstream & affect hair health including new baby hair that would be grown from our treatment. Therefore, We recommend use of our mild Herbal Shampoo which has Antifungal properties and is added with mild cleansing agents. Our treatment used in conjunction with our Herbal Shampoo yields faster results. It is advisable to take hot towel steam before applying hair cream to get the better results. (Dip bath towel in hot water, squeeze & wrap it on the entire scalp for 1-2 min. Repeat procedure 3-5 times). Apply cream immediately on warm scalp skin. Regular & proper application of products yields faster results. Most users feel a noticeable difference after just ONE MONTH! Also dramatically improves the appearance of healthy hair. New hair growth & development of new hair follicle is noticeable in the form of small baby hair. You will notice reduction in hair loss and an improvement in the condition of hair i.e. less breakage, stronger hair. Thickening of existing hairs can be seen. Discontinue treatment after desired results attained. Unlike other products, even after treatment completion, once recycling starts it will not revert. We recommend using Amazing Nourishing Hair oil once or twice a week to maintain healthy head of hair. Note: Individual results may vary depending on your skin type. Prolonged use will give better results. 30-40 Days: stops further baldness, reduction in hair loss and visible new growth. 2-5 Months: increased hair growth. Affected area starts filling. 5-7 Months: full density with healthy hair. 3-6 Months: increased hair growth. Affected area starts filling. 12-14 Months: full density with healthy hair. shiny bald spot from years. 30-40 Days: shiny skin start getting normal, visible new growth. 5-8 Months: increased hair growth, bald patch start reducing. 16-20 Months: healthy head of hair. * Here patience & regular application is required as it has probably taken years to develop the problem and it will take a few months to reverse it. Effective for Excessive anger or hate, Migraine headache, Liver disorder, hemorrhoids, Anemia, Hypertension, activate cells for new growth, proper blood supply to scalp. The Shoulder stand invigorates and rejuvenates your whole body. Lie down on the floor with your legs together and your hands, push down, by your sides. Inhaling, push down on your hands and raise your legs straight up above you. Lift your hips off the floor and bring your legs up, over and beyond your head, at an angle of about 45o. Exhaling, bend your arms and support your body, holding as near the shoulders as possible, thumbs around the front of the body, fingers around the back. Push your back up, lift your legs. Now straighten your spine and bring the legs up to a vertical position. Press your chin firmly into the base of your throat. Breathe slowly and deeply in the pose, gradually trying to work your elbows closer together and your hands further down your back toward the shoulders, so as to straighten your torso. Keep your feet relaxed. “Pada” means “foot” and “Hasta” means “hand” in Sanskrit. You have to catch your big toes with your hands in this posture. Padahastasana secures useful in indigestion hyperacidity and other abdominal problem. Useful in joints pain It also gives a good pull to the sciatic nerve. The ankles, calves, the back of the thighs, hips, waist, back, shoulders, neck and head are all well exercised and blood is rushed to all these parts. Stand upright with the feet parallel and the heels about six inches apart. Inhaling, raise your hands straight above your head, palms outwards. Exhaling, bend your head and trunk from the waist as far back as you can without tipping over, with upper arms touching the ears. Inhaling, bend forward from the waist, keeping the knees straight and the upper arms touching the ears. As soon as the arms extend straight above your head, start exhaling and continue to bend your head and trunk forward from the waist. Reach forward and catch hold of the big toes with your thumbs, index and middle fingers. Holding out your breath, pull the big toes and move your forehead into the space between the knees. Keep the legs straight and the knees stiff. Maintain this position for a few seconds while holding out your breath. Start inhaling and return slowly to the upright position in the reverse order. Healthy diet can supplement your hair loss treatment. In order to reduce or avoid hair loss, eating healthy to acquire the necessary vitamins is the first step. Fruits-melons, berries, bananas, oranges, apples and many other fruits can supply your body with the proper vitamins to reduce hair loss. Vegetables-while all vegetables will provide your hair with additional vitamins, the ones that offer the most benefits are those of the green leafy variety, including spinach, cabbage, etc. Dairy-increasing your dairy intake, including milk, eggs and cheese, can increase your hair’s overall health by providing it with the vitamin B-12 as well as protein. Lean, healthy meats-this includes chicken, nuts, fish, and organ meats (such as liver). By adding these to your diet, or increasing your intake of these items, you will supply your hair follicles with the vitamins they need for optimal operation and hair growth. Water-consuming at least eight 8-ounce glasses of water per day will help transport the needed nutrients to your hair and help keep your hair strands hydrated and strong. No matter how beautiful you are, if your hair are rough and brittle you will lose beauty on your contour. Always, keep in mind hair are an essential part of our body and need special attention and care. Handle your hair gently. Whenever possible, allow your hair to air-dry naturally, Avoid compulsively twisting, rubbing or pulling your hair. The purpose of shampooing is to remove any dirt or impurities from hair making them clean and tidy. Harsh shampoos will just cause the sebaceous gland to overcompensate by producing more oil than necessary. It is advisable to wash your hair daily or alternate days using Amazing Herbal shampoo or any baby shampoo diluted with water. Acupressure therapy is also helpful in scalp related problems because scalp is getting nourishment through the small capillaries. There are some points on which applying certain pressure you can stimulates the supply to that area .You do not have to use all of these points. Only working on one or two of them whenever you have free time can be effective during your treatment period. It’s important to drink plenty of warm water after the massage, helps to clear away toxic substances in our body. Working on these points can help you get better quicker results in your health related problem. Mix a tsp. each of salt and black pepper powder with 5 tsp. of coconut oil and apply it to the bald patches. It will restore the growth of hair. Good home remedy for alopecia using Onion: Round patches of baldness appear on the scalp when hair fall off in bunches. Onion juice should be rubbed into such bald patches regularly for some time. It will help the hair to grow again. Mix some lemon juice in double quantity of coconut oil apply on scalp before shower. Wash hair on alternate day with decoctation of mulathi. Massage with fresh coriander juice. Apply paste of carrot on scalp. Useful Home Remedies for Baldness. 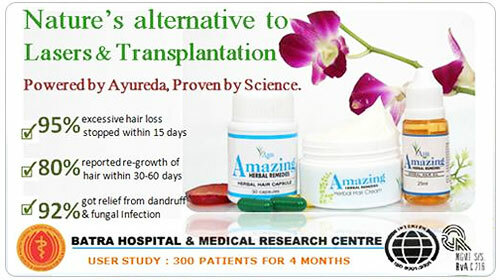 Ayurveda have complete solution in Hair Fall.